The CIC Higher Education community ushered in the month of March with a number of activities that are aimed to nourish students intellectually, socially and mentally. Starting off with the International Women’s Day Morning Tea on 8 March, faculty and staff exchanged pleasant conversations over a shared meal. It was a simple gathering in honour of women and their contributions to society. This week kicked off with Term 1’s O-Week on 18-19 March. As part of orientation week, CIC introduced the new House System wherein students, faculty and staff will be divided into four houses, reminiscent of the fictional Hogwarts School and its four houses. In the case of CIC Higher Education, the houses will be named after Australia’s celebrated native animals and assigned their respective colours: Blue Koala, Red Kangaroo, Yellow Platypus and Green Wombat. Students have been assigned their respective House animal and given a coloured wristband in their Orientation Packs. The air is rife with excitement as the campus prepares for the formal launch of the Houses on Monday, 25 March, wherein the reward system will be explained as Houses strive to earn badges. Guest presenters during the orientation included organisations like Study Melbourne and AnimalsofOz. AnimalsofOz brought in Australian wildlife and introduced them to students: Bubblegum, the blue-tongue lizard; Snappy, the salt water crocodile; Donnie, the tawny frogmouth; Polly, the python and Doser, the wombat. Students were given the opportunity to get up close and personal with the animals, learn about Australia’s wildlife in general and had the ever-present selfies. 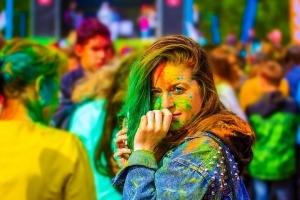 The Festival of Colours or Holi is a Hindu celebration predominantly celebrated in India and Nepal but has recently spread to South Asia, North America and Europe. 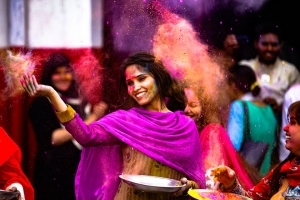 Also known as the Festival of Love, it has become a celebration of life, frolic and colours. On this day, people unite and forgive one another for past hurts and move forward to new beginnings. The CIC community will mark the day with fanfare and students should watch out for the smearing of colours as anyone is fair game. The Low Impact Exercise Class, a weekly activity for students and staff, will be introduced on this day to encourage the CIC community to stay fit and healthy. The table tennis committee will be facilitating House and individual registrations for this term’s table tennis tournaments (round robin draw). Watch out for the upcoming activities in April!